Canberra, March 18: Actor Chris Hemsworth took to Instagram, sharing a photograph of himself and an "epic" animal he said he'd encountered in Australia. Hemsworth took his "first quokka selfie" while visiting Rottnest Island, he wrote in the caption. In the photograph, the actor appeared to making a face similar to that of the furry critter. "Got my first quokka selfie this week at Rottnest Island," the Thor star wrote. "Epic little creatures are all over the island just cruisin through the day doing their thing. Get there and check it out!" How to Get a Fit Body Like Thor? Here’s a Sneak Peek Into Chris Hemsworth’s Workout Regime (Watch Videos). The post included a second photograph that also featured his wife, Elsa Pataky, according to people.com. The actor separately posted a recording showing him interacting with the animal and successfully encouraging it to take a plant piece from him. 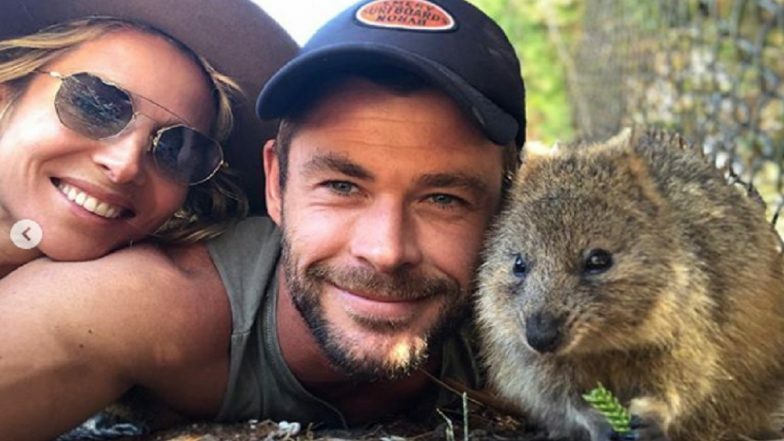 Hemsworth quipped that during his time at Rottnest Island, he managed to break into the quokkas' inner circle, and had earned a new name worthy of the achievement. "Spent 3 weeks crawling around the dirt, studying the Quokkas movements, mimicking their language and eventually gained their trust and was accepted as one of them, I now go by the name Quokkachris," he wrote.